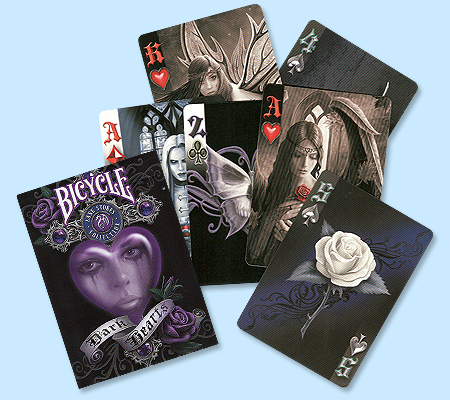 Bicycle Anne Stokes Dark Heart Playing Cards feature a new variation of Anne Stokes' famous fantasy art. These Decks feature the same premium quality Playing Card stock for which Bicycle is known throughout the world. Each Anne Stokes Dark Heart Bicycle Playing Card Deck features an unusual sword design on the card backs and 52 different faces with a selection of intriguing Anne Stokes imagery. For more information or volume pricing on Bicycle Anne Stokes Dark Heart Playing Cards, please contact us at 1-800-233-0828.